At its core, physics is the study of matter and energy—the fundamental fabric of the universe. It's a field seemingly full of paradoxes: accelerator rings 15 miles around help us examine the smallest things imaginable. The faster something moves, the slower time passes. So maybe it’s no wonder that in seeking to understand the core of reality, physicists discover knowledge and create tools that start to sound like the province of fantasy. This year’s Nobel prize in physics was shared by three scientists—Arthur Ashkin, Donna Strickland, and Gérard Mourou—who laid the groundwork for two such tools: optical tweezers and chirped pulse amplification. The winners of 2018's Nobel prize in physics. Image Credit: Ashkin, Mourou: self-provided. Strickland: University of Waterloo. It’s something of an old joke among physicists that we’re all just collections of atoms cooperating to study other atoms. But as squint-inducing as that thought is, it’s nothing compared to the technical challenges that it implies. Even well above the atomic scale, manipulating things using conventional tools becomes nearly impossible: you can’t really grab an individual virus with tweezers, no matter how fine-tipped they are. To control things with precision at a microscopic scale, it took the creative mind of Dr. Arthur Ashkin to realize that we could use a different set of tools entirely: tools made from pure energy. Nearly 50 years ago, Ashkin was working as an optics researcher at Bell Labs, a historical powerhouse of scientific research that dates all the way back to Alexander Graham Bell’s invention of the telephone. It was already well known at the time that light has the ability to exert force on an object, a phenomenon called radiation pressure. Ashkin wasn’t the only one intrigued by the possibility of using radiation pressure to manipulate tiny objects, but previous attempts to harness the principle had run into heating problems: trying to trap a particle by focusing laser light onto it would invariably end up heating the object of interest, producing motion—but not in a precise, controllable way. Ashkin's efforts were unsuccessful at first, and he even had his funding for the project cut by his supervisors—but he persisted, and eventually succeeded where others had failed by using the right kind of particles: tiny, nearly transparent spheres of latex rubber, suspended in water. A particle that simply deflects light as it passes through, Ashkin realized, experiences radiation pressure differently than a particle that absorbs or reflects light—and it doesn’t heat up nearly as fast. If you’ve ever played with a magnifying glass, you know that light emerging from a focusing lens takes a sort of hourglass shape, converging at the focal point before spreading out again on the far side of it. Although laser beams are typically tiny in diameter to begin with, they follow the same rules of optics as the light from the sun—a lensed laser beam forms a narrow waist at the focal length, and then spreads out again. In a 1970 paper that laid the foundation for decades of science to come, Ashkin showed that focusing laser light on a transparent particle pulls it toward the axis of the beam, trapping it there and pushing it slowly “downstream” in the process. By pointing two focused lasers at one another, he showed that it’s possible to create a stable, three-dimensional optical trap. A figure from Ashkin's original 1970 paper, describing his experimental setup. Although that paper was the first of many on the road to what we now call optical tweezers, it contained the kernel of the idea, explained in an elegant and relatively simple way. In honor of Dr. Ashkin being awarded the Nobel, all his papers related to that work published by the American Physical Society have been made free to read and download. Even in its early years, laser science had no trouble achieving the kind of power Ashkin needed to stabilize those tiny particles against the pull of gravity and the random wandering impulses of Brownian motion. In fact, we can think of his crucial insight as being a way to get around the problem of too much power—the heating that would drown out the effects of radiation pressure. In that respect, his work shares a common theme with that of this year’s other two prizewinners. In the mid-1980s, Donna Strickland was a graduate student at the University of Rochester, working toward her PhD under the supervision of the French optical physicist Gérard Mourou. But their field of study, laser physics, had hit a wall: no material on Earth could channel the kind of power that scientists were trying to wield. Any laser requires a gain medium, a material where energy is converted into laser light; in the earliest lasers, a ruby crystal was used as the gain medium, taking in ordinary light and putting out a laser beam. But the need for a gain medium creates certain limitations: crank the power up too high, and even a ruby can melt. On top of that, the optical properties of any substance can be altered by a strong electric field, so a material like ruby—which is a good gain medium at low power—stops being useful when you start dumping enormous amounts of electromagnetic energy into it all at once. It’s worth taking a second here to remember that, in physics, the word power has a very specific meaning: energy per unit of time. It’s generally measured in watts—like the familiar 60 watt lightbulb, which uses 60 joules of energy per second. That’s enough to light a room, but if that kind of power is focused into a narrow beam the way it is in a laser, it’s an awful lot: even a one watt laser can pop balloons, light matches, and burn a person’s skin. But high-intensity lasers, with powers up to billions of watts, can be useful in everything from fusion research to corrective eye surgery. If pointing a multi-watt laser at your eye sounds terrifying, remember that these devices are usually operated in extremely short bursts, so the total amount of energy they deliver can be tiny, even if the power is high. So to get around their power problem, Strickland and Mourou turned to a technology that had been invented years before, but never applied to lasers: chirped pulse amplification, or CPA. It's a bit like what's going on in the posters here, only you boost the power by a factor of 1,000 between taking the beam apart and putting it back together again. Although we usually talk about laser light as being monochromatic—of a single color and energy—the truth is that there’s always a little bit of a spread to its spectrum: some photons in a laser pulse are a little higher energy than the average, some a little lower. While that might seem like a shortcoming, Strickland and Mourou realized that this fact could be turned into an advantage: different colors of light can be separated from one another, using a prism or similar device. With the right apparatus, a pulse of ten thousand photons can be spread out into a thousand parallel pulses of only a few photons apiece. By taking those pulses and putting each into its own separate gain medium at the same time, we can amplify them individually, until we've got a thousand pulses, each as strong as the original was. Finally, running the amplified pulses through an inverted version of the spreading prism that we started with, we can recombine them into a single short burst—now a thousand times brighter than the pulse we started with. A more technical diagram of the principle behind CPA. In practice, reflective gratings are preferred to prisms, because a prism runs into many of the same problems as a gain medium—namely, it's liable to melt if you try and use it to split a 5-gigawatt laser beam. 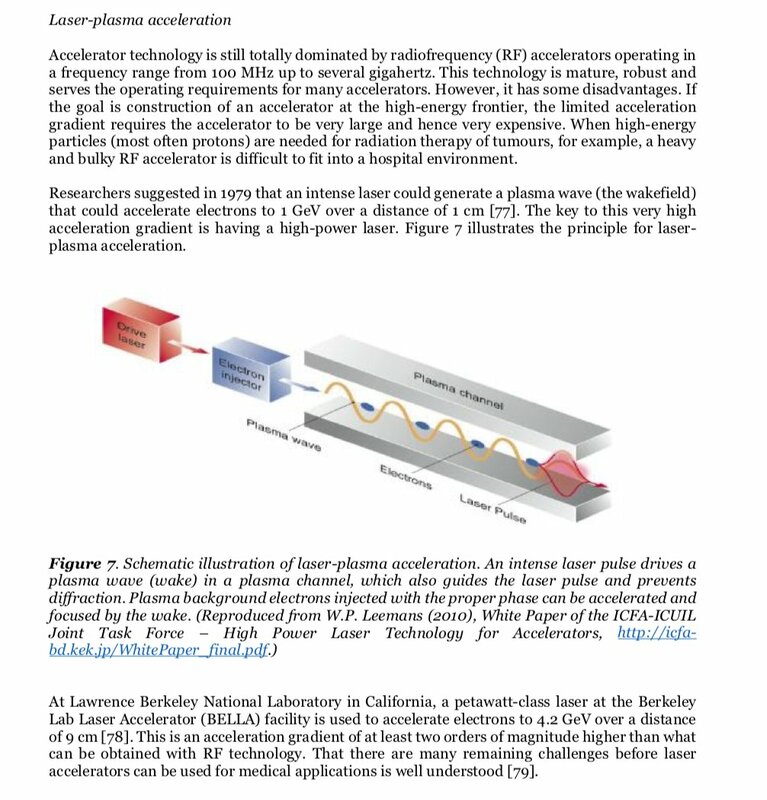 It's not a simple scheme, or an easy one to put into practice (if it were, it might not be Nobel-worthy science), but it shattered the wall that laser physics had run up against. Since Strickland and Mourou's seminal work was published in 1985, the technique has found applications everywhere from laser manufacturing workshops to cutting-edge physics research labs. CPA has already been put to use in corrective eye surgery, but the possible medical applications don't stop there—deploying it at lower frequency ranges may even prove useful in driving the next generation of particle accelerators, which could make proton beam therapy a more practical solution for many cancer patients. When the work of just a few people has such wide-ranging implications, it's already an inspirational feat—but Strickland's story is even more remarkable than your average Nobel winner's: she carried out world-changing research as a grad student, and did so in spite of an academic culture that generally steers women away from fields seen as requiring innate brilliance. Indeed, Strickland is the third woman ever to win a physics Nobel, and the first in more than 50 years. In the announcement of this year's prize, the common theme between the two works was framed in a memorable way—as "tools made from light". The physics behind this year's Nobel-winning achievements is pretty incredible in its own right—manipulating infinitesimal objects using beams of energy, engineering around our limitations to create a light of unprecedented brightness—but it's truly awe-inspiring to remember that these are also largely means to an end. This year's physics Nobel went to people who used the best tools at their disposal to build even better tools. That's a cycle that doesn't end, or stay within the bounds of one field: Optical tweezers are deepening our understanding of molecular biology, and CPA is finding uses all over the world. Their inventors gave us a new set of tools to work with, and now the most exciting question is: What will we build with them? I want to propose that the light refractive index could be improved to help research as the article is very dependent on that information to improve the index this should be the formula (n=c/v^3). This will help correct for variances in refraction. Thank you. As I work metrology to help measurement science.